However, if you have water spots on your windows, you might find that a simple drive through the car wash isn’t enough. These spots, caused by buildups of minerals in the water (from the car wash, sprinklers, and the rain), often require a deeper clean. And because they’re on the windows, you’ll see them—and be annoyed—every time you hop behind the wheel. There are two kinds of window spots: the ones that form immediately after getting a car wet and allowing it to air dry, and the ones that are more deeply etched into the glass because they’ve had a chance to harden and build up over time. The first kind of spots are easy to get rid of simply by wiping your car down immediately after you wash the car or you come in out of the rain. Water that’s allowed to evaporate naturally will often create small droplets on your windows, which provide a concentrated burst of residue that will be left behind. 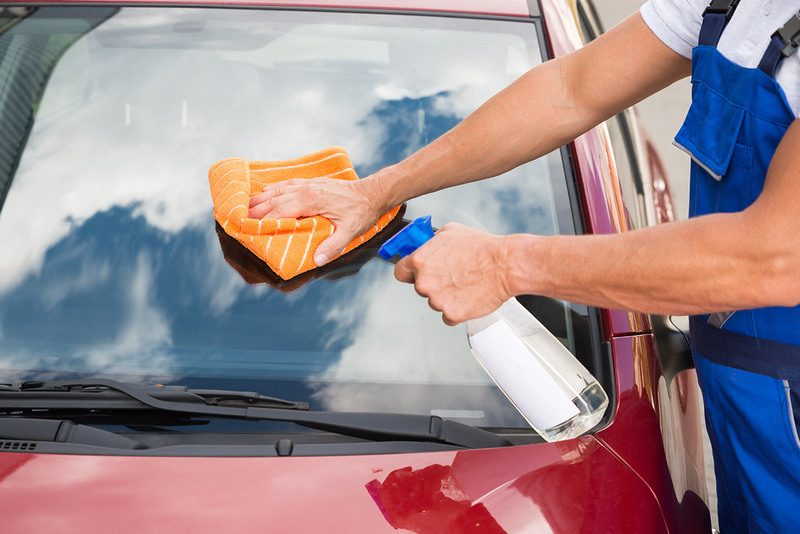 By taking the time to thoroughly hand-dry your vehicle (both the body and the windows), you can prevent these spots from forming in the first place. The hard water spots that don’t wipe away so easily are caused by calcium, sodium, and other mineral deposits that occur naturally in the water you use every day. Different locations have different levels of minerals in the water, so your tendency to develop water spots will vary. When these deposits are allowed to harden for a long period of time, they bond to the window and require deep cleaning. You can invest in expensive cleaners and towels to help eliminate window spots, but your best bet is a 50/50 mixture of water and vinegar. Place this mixture in a spray bottle and apply it liberally to your windows (the good news is that you can use it for both outside window spots and inside sticky finger spots). Allow it to set for a few minutes and then wipe it away using a microfiber cloth. Depending on how severe your window spots are, you may need to do this a few more times. Any areas that don’t come clean after several applications may require a more intense approach. Wiping the windows with fine grade steel wool can sometimes help, but it’s important only to use this on the windows and not the body of the car. As with almost anything automotive-related, prevention is the best cure. Once those window spots come clean, make sure you carry a microfiber cloth for a quick wipe-down after every wash and accidental run through a sprinkler.